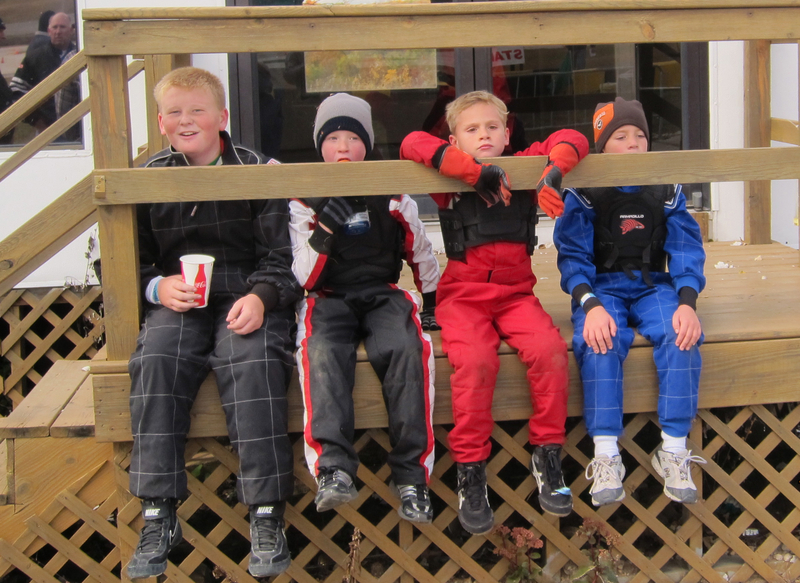 This week, Road America Karting Club had its oval fun race. In all that spaghetti of a track there is an oval. Most oval racing is done clock wise, turning left. This set the track up in the oposite direction than usual. The racers now started in what is usually the exit of the track, and exit was where the entrance usually is. Jason took to the oval like a fish to water. He knew within a few laps exactly where the kart needed to be so he could just put his foot down, not let up, and completely ignore the brakes. It was pretty amazing to watch the kids crank out 20 second laps, never letting up. We expected 5 karts to race but unfortunately, a newer driver did have some confusion about getting on and off the track and crashed into the hay bales. He was unhurt but the kart was damaged beyond what could safely be repaired at the track and was not able to race. There are two types of kart racing in the U.S. Sprint racing, which is how Jason and I have been spending our summer. This is similar to F1, Indy, and many SCCA racing classes. The other is oval racing, like NASCAR. There are two camps of oval racing: dirt and pavement. If you are interested in seeing a bit of more about oval racing check out one of Jason’s favorite movies “Racing Dreams“, a documentary about 3 kids. The Road America Karting Club is interested in starting oval racing next season as well as sprint racing. After practice, it was suggested that I change the rear gear to a smaller one to make Jason’s kart go faster. Since the rules were kind of out the window today, I decided to do it and see what happened. During practice we ran our normal 57 tooth rear gear. This gave Jason high 18 and 19 second laps. When I put on a 55 tooth gear the rear wheels spun faster, which gave him mid 18 second laps. The other 206 kid kart, Mason #33, was also running a 55 but was not running very well. You can never tell with these kids though – sometimes they surprise you once racing starts. Running order for Heat 1 was Easton, Mason, Bryce and Jason. The green flag was dropped and Easton held the lead. Jason came up on the outside, passed Mason and settled in the second place at the corner. In the next straight Jason blew by Easton for the lead and started making the lead grow. For the rest of the race Easton and Bryce battled for second place. Mason pulled off after a few laps. For Heat 2 the lineup was Jason, Bryce, Mason, and Easton. Jason took the lead from the start and stayed there. Mason, again, pulled off after a couple of laps. Easton and Bryce mixed it up again, all the way to the end. The the lineup for the feature was Jason, Bryce, Eason, Mason. I had changed back to the 57 gear because I felt guilty about running a different gear than normal. This was a mistake. Mason (who still had the 55 gear) woke up worked his way past both Bryce and then Easton and started to chase Jason down. Jason held on and lapped Bryce and started to reel in Easton, while Mason worked on Bryce. Mason finally got by Bryce and began to close on Jason. I held my breath as the while flag flew, with Jason on Easton’s heels and Mason just a few yards behind. Jason made a final push on Easton at the checkered flag for the win. Mason was still close behind but not close enough. I am struck at how consistent the Briggs LO206 motor is, for very little work. Jason has had to fend off fellow 206 drivers using his driving skills alone and his lap times are getting better. The comers have been wearing out at the end of the season and slowing down. I am really glad I went with this setup. It has made racing about racing and not how much cash I can throw at the kart. 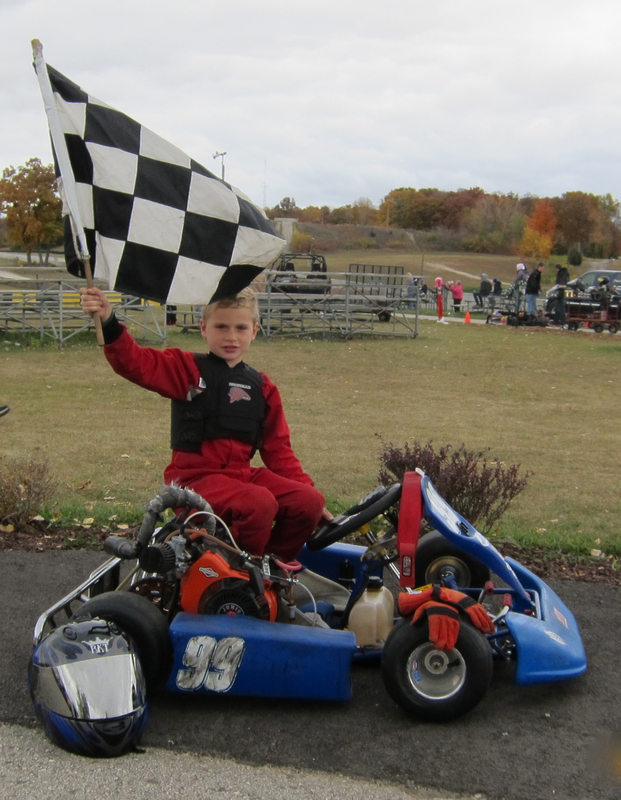 This was Jason’s last race as in the Kid Kart class. The Kid Kart has been taken apart and we are now working on finishing the Sportsman.